This is very happy news and it's also good to see that Lina is on her way back after what has been a particularly difficult summer for her. Tonight was my final journey into the world of virtual concerts. I wonder if Aftonbladet will ever try this again, or if they have blazed a trail for others to follow? 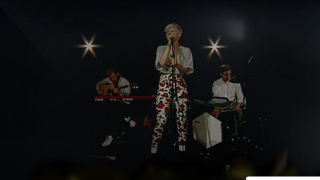 Tonight was one of the most long-awaited of this year's concert series - Robyn. 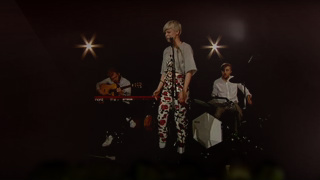 At the moment, Robyn's musical career is on an absolute high, with her ambitious three-album Body Talk project. Three of tonight's songs - "Hang With Me", "Dancehall Queen" and "Dancing On My Own" are from the new albums, whilst the other song in the set was the now-legendary "With Every Heartbeat". Robyn initially took to the dimly-lit stage dressed in what looked like a flying jacket, which she soon removed to reveal a grey top and some very interesting patterned trousers/leggings (!) and gave an excellent live performance as usual. Unfortunately I don't know if it was my own internet connection, or if anyone else experienced the same thing, but the picture kept freezing and the sound was a little warped, especially during the first couple of numbers. 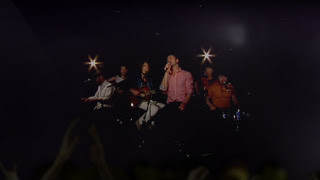 Apart from that, I really enjoyed the concert. As with previous concerts I had the same moans and groans about the overall visual experience and the virtual-effects, and a lot of changes need to be made to improve the format. However I guess it was a good opportunity for us to see some of Sweden's best artists - Mando Diao, The Ark, Salem Al Fakir and Robyn - in a unique live setting. Yep, the picture above says it all. I logged in at 19:55 British time as usual, and waited. Waited. Waited. And waited....and....nothing. However I did enjoy the show - it was a very nice performance by Salem and the band, and I hope they enjoyed the experience too. I'm very happy about this. As you know I was a big fan of Erik last year in Idol and was delighted when he won. However it would be fair to say that his solo career hasn't really gone according to plan (like some other previous Idol winners), so I'm glad that he will finally get the chance to showcase his undoubted vocal talent in his natural environment - rock music. Looking forward to some new music from them. I still love their Melodifestivalen entry "1000 Miles" - and I wonder if they'll ever compete in MF again? 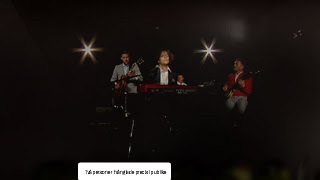 Last night I was "in the audience" for the latest of Aftonbladet's digital concerts, this time featuring one of my all-time favourite Swedish bands - The Ark. 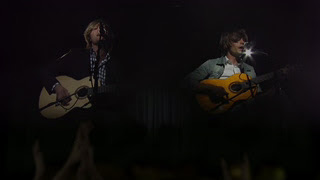 To be honest, I wasn't really expecting much after my disappointment with the first gig (Mando Diao) however at least this time it wasn't just two blokes with a guitar, but the full band. The set did last a little bit longer, although that was probably due to the fact that Ola talked a lot between each song. Which was ok, but "a little less conversation - a couple more songs please" would have been better. Anyway they played "Take A Shine To Me", "Superstar", "One of Us Is Gonna Die Young", "It Takes A Fool To Remain Sane" and "Calleth You, Cometh I" so I've no complaints about the song choices, and they did a pretty good job within the limitations of an acoustic setting. The whole thing is still very weird though: it still looks as if the act on stage is down a dark tunnel a very confined space. I still have the same criticism as with Tuesday's show - it's far too dark! Please please please fix this, Aftonbladet!! Also last night the constant applause got a bit annoying after a while, drowning out what Ola was saying. I know that I could have booked tickets with a better view but didn't, because I don't think my internet connection would support the HD thing, and I'd rather get to see and hear the show with a poorer view rather than have my connection break down and not see it at all. Of course tomorrow night is the big one for me - Salem Al Fakir! I'll post my review on here and at Planet Salem tomorrow night. You probably didn't expect this one so soon, but we've decided to return to Turkey for our summer holiday in four weeks' time. After some intensive searching and consideration given to various alternatives, we finally settled on Turkey again, as we loved it so much last year. And after a couple of hiccups (notably the possibility of airport strikes, which thankfully have now been averted) we finally got booked up tonight!! We are going to a different place this time - Bodrum - but I'm sure the famous Turkish hospitality will be overflowing from the beginning to the end of our holiday :) of course there will be a full report to follow! Big news today!! It was confirmed at www.jamiroquai.com today that the band's 7th album, titled "Rock Dust Light Star" will be released on 1st November 2010. 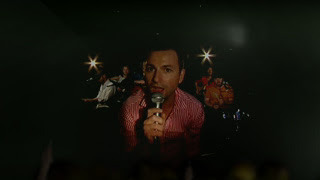 More info at http://www.jamiroquai.com/site/news/227/jamiroquai's-new-album-is-called-'rock-dust-light-star' where you can also find a little taster of new song 'White Knuckle Ride'. Jamiroquai is one of this country's most underrated acts - they seem to be more appreciated within Europe, where music fans seem to have better taste of course. It's been five years since the fantastic "Dynamite" was released, and Jay and the boys have been sooooo missed from the UK music scene, so I'm really glad to have them back at long last. Part two of an occasional series which I'm going to call "A tourist in my own country". Yesterday was a rarity - a beautiful, warm, dry day. Faithful travelling companion and I headed off to the conservation village of New Lanark, which is now a very popular tourist destination and a UNESCO World Heritage Site. This was my first visit to New Lanark (although faithful travelling companion had visited before). As we were only there for a couple of hours, we didn't have time to explore the visitors centre - we'll do that another time, as there's no doubt we'll be returning. New Lanark is a unique and rewarding day out destination, and a great place to get away from it all. Above: one of the restored buildings. Above: Looking down towards New Lanark, on the way to the Falls of Clyde. Above: Corra Linn, one of the Falls of Clyde. All in all, a fabulous day - beautiful weather, beautiful scenery...and I walked 4½ miles too! 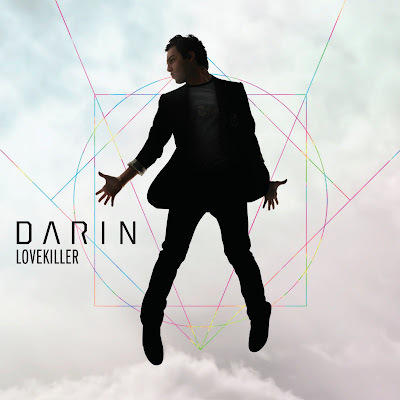 It won't be long till the release for Darin's new album "Lovekiller"....between now and then, Darin will be posting a video clip of a new track each day on his YouTube channel: www.youtube.com/darinofficial. but for all of you who don't read that blog, I thought I'd mention that Aftonbladet is launching a revolutionary new internet live concert-concept with real audience interaction. According to this Aftonbladet article/interview, http://www.aftonbladet.se/nojesbladet/article7593697.ab one of Sweden's greatest ever popstars (IMHO) is releasing his new album later this year. It will be Orup's first solo album since 2005. 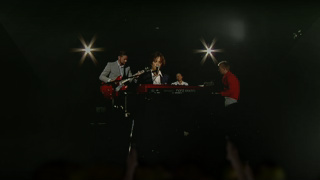 Since that time of course he's been recording and touring with the legendary Lena Philipsson - 250 live shows, no less. They recorded an album together as a duo, which was OK but I really wanted to love it more than I did. A case of the parts being greater than the whole, I guess. Anyway I'm eagerly awaiting this new solo album and no doubt I'll be reviewing it on here! I wonder if Lena's got any new music on the way? It doesn't take much to push me over the edge at the moment, and tonight, I am (at the very least) teetering on the brink. I don't object to the song, but it's one thing dishing out the autotune-treatment to the likes of Iyaz, Sean Kingston, Jason Derulo etc...i.e. to cover up fly-by-night, musically redundant chart fodder, but it's another thing doing it to the chorus of a song by a very good singer whose talent does not necessitate this. I don't have anything against vocoders, but autotune is really p**sing me off. Please make it stop. 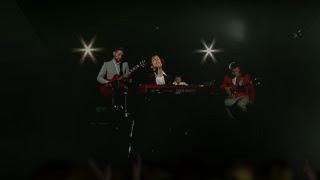 Oh and one more thing, the chorus of the new Jack McManus song "Heart Attack" also slightly suffers from autotune-disease, although on a more bearable level: http://www.jackmcmanus.co.uk/. Ever felt like a tourist in your own country? I might be a bit of an expert on European travel by now, but when it comes to my own country that's another thing entirely. So it's about time I checked out some new places...! Yesterday, faithful travelling companion and myself "took the high road" and headed for Balloch, a village on the south banks of Loch Lomond. Of course the main obstacle stopping you from discovering this country will always be our horrible, wet weather but if you wait for a dry day you'll probably wait forever. So, umbrellas at the ready, we arrived in a wet (but mild) Balloch, a nice little place with more than enough dining options but not much else really. (Although there is a shopping centre called Loch Lomond Shores, but that's for another visit). The prime draw here is of course Loch Lomond itself, and we took the opportunity to take a one hour cruise which takes you as far as Inchmurrin (the largest island on the loch) and then back. It was all very lovely and scenic and serene, which was just what I needed after a turbulent week! We also took a little stroll through a woodland trail down to the edge of the loch, where we dipped our toes in the water. The rain went off, the sun came out later on, but by that time we had to make our way back for our connections home. As you know, my definition of the great outdoors is usually the bit between the restaurant and the shopping mall, so this was a nice new experience for us. We really enjoyed our day out, and would like to do something similar again in the future! 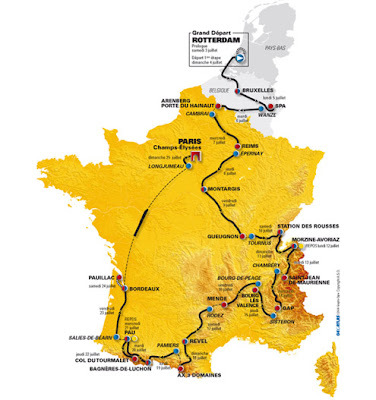 The 2010 Tour de France ended last Sunday, as usual on the Champs-Elysees in Paris, and as usual with an exciting sprint finish. The "Manx Missile" Mark Cavendish chalked up his fifth stage win this year, although that still wasn't enough for him to win the points classification. (This year's green jersey winner was Alessandro Petacchi). Former multiple winner and race legend Lance Armstrong meanwhile completed his final Tour and announced his (second) retirement after the race. There were high hopes for the British riders this year, and a new British team (Team Sky) in the competition. Great things were expected from Bradley Wiggins, Team Sky's main man, however inevitable disappointment was to follow. Wiggins was philosophical about it all, and described it as a 'bad season'. Team Sky had another couple of promising young riders: Norway's Edvald Boasson Hagen, and the Welshman Geraint Thomas, and they both did well this year and showed great promise for the future. 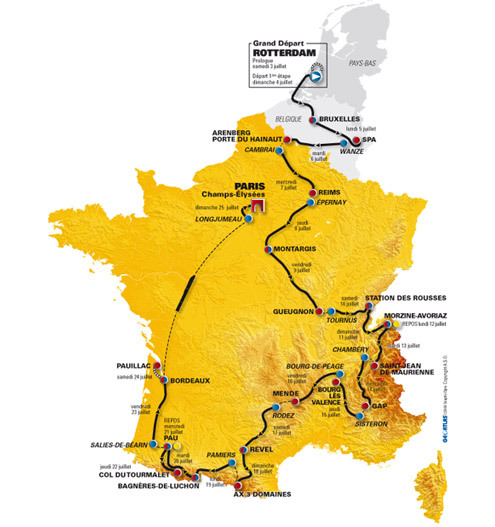 Usually the early stages of the Tour are predictable and uneventful, all flat stages and sprint finishes. This year's Tour started in Holland, and then travelled down through Belgium, finally entering France. The organisers of 2010 clearly had, dare I say, a vicious streak?! It was cobbles, chaos and carnage in the opening days, with rough weather and rough roads. 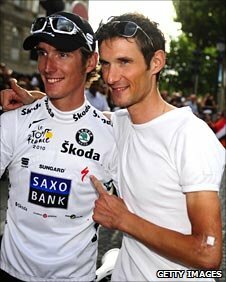 One major casualty of the cobblestones was Frank Schleck who had to retire through injury on Stage 3. The Schleck brothers, Frank and Andy, were serious contenders to prevent reigning champ Alberto Contador winning the race again: but it was left to Andy to soldier on. By stage 15, Andy was in yellow, and all was going well. That was until the chain came off Andy's bike. Alberto Contador, sitting on Schleck's shoulder, then launched an attack and all hell broke loose. I know everyone has their own view on the situation, so here is mine: That was the point the Tour turned sour for me. Did Contador need to attack? Yes. Did he need to attack so fiercely? Definitely not. Andy Schleck deserved to be very, very angry. And all the YouTube apologies in the world didn't make it right. Yes, the 2010 edition of the Tour de France was exciting, but Contador's inevitable eventual win left a bit of a bad taste for me. Fingers crossed that Andy Schleck's time will come!